Lockout service: If you’re experiencing an auto lockout in Carroll County, NH, our locksmiths can be immediately dispatched to your location to help you get inside your vehicle, or to cut you a new set if your keys are lost. Tire repair: We can deliver air, patch a damaged tire or replace it with a spare as needed, and all our service vehicles are equipped with 4-way lug wrenches and portable jacks in the event that yours are missing. Jumpstarting: We’re happy to jumpstart your vehicle with our battery boosters and to make minor adjustments or repairs to your battery if necessary. Fuel or battery delivery: If you’re out of gas or diesel or your battery is completely dead, we’ll gladly give you a prompt delivery to help you get back on the road in no time. 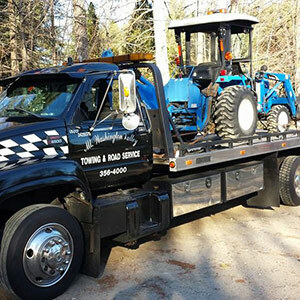 Towing: We have a large fleet of flatbed tow trucks, fully equipped with winches, wheel lifts and dollies, to provide you with off road recovery and secure light to medium duty towing service in Carroll County, NH, for nearly all types of vehicles, including motorcycles and classic or vintage cars. Our experienced drivers are trained to operate in any circumstance, and we’re happy to tow your vehicle to the nearest auto body repair shop, an insurance-accepted mechanic or our storage unit, depending on your needs. Accidents and emergency clearing: We offer the service of our trucks and professional drivers to carefully and quickly clear the road for the safety of other drivers. Storage: Our storage facility is equipped for all vehicles, from motorcycles and cars to trucks and RVs, and we’re happy to house your vehicle until your insurance company can perform the necessary inspections. 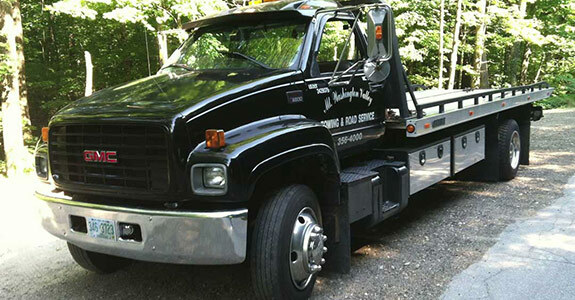 For everything from auto locksmith services to emergency towing, Carroll County, NH, residents turn to us for prompt, safe and reliable roadside assistance. Give us a call today at 603-356-4000 to inquire about any of our services or to request assistance in your time of need.